Book early and save $1,350 per person, double occupancy on stateroom categories 1, 2, and 3*. Embark on an all-encompassing A&K voyage along nearly the entire navigable coast of Italy. 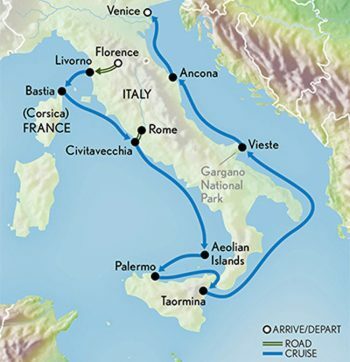 Begin with two days in Florence, the land of the Renaissance, before cruising on brand-new ‘Le Bougainville’ to treasures from iconic Rome and Venice, exotic Sicily and the paradisal Aeolian Islands to Puglia’s Gargano National Park, UNESCO-protected Urbino, and little-known Bastia on French Corsica. *PLEASE NOTE: This journey contains some active elements and is subject to change based elements beyond A&K’s control, including weather and sea conditions. The final itinerary will be determined at the sole discretion of the Captain and Expedition Leader. Arrive in Florence, centerpiece of the Renaissance, where you are met and transferred to your hotel. Join fellow guests for a welcome reception this evening. Explore one of the most culturally rich cities on earth with a choice of curated excursions. Discover some of Florence’s most iconic sites before an afternoon in the Oltrarno District, where you may walk its winding streets, admire exquisite jewelry shops and learn about the famous Renaissance families who resided here. Alternately, choose a quintessentially Tuscan experience, leaving the city behind for the medieval town of San Miniato. There, meet a truffle hunter and his faithful dog, learning the history of this prized treat before a truffle-themed lunch. History buffs, meanwhile, can visit Palazzo Vecchio, originally known as Palazzo della Signoria, the former residence of the Medici clan and the setting where political power was wielded; the interior apartments contain decorations by Michelangelo and Donatello. This evening, drive to Artimino Villa for a welcome gala dinner, complete with a string quartet and an operatic recital. Take another opportunity to experience the treasures of Tuscany with more excursions designed for discovery. Art lovers can head to the Accademia Gallery to see one of the most iconic sculptures ever created, Michelangelo’s David, followed by a visit to the Uffizi Gallery, where masterpieces such as Caravaggio’s Medusa and Botticelli’s Birth of Venus hold court. You may also leave Florence for Pisa, taking in its charming Baptistry, the Campo Santo and the Duomo before stopping at the world-famous Leaning Tower, even climbing its 284 steps if you like. Alternately, visit the charming city of Lucca and stroll its picturesque town center, closed to car traffic. See the Piazza dell’Anfiteatro, which still follows the curve of the original Roman amphitheater, and the impressive 16th-century city walls and ramparts, now lined with leafy parks and promenades. Later, drive to Livorno to board ‘Le Bougainville’ and enjoy your first dinner on board. Your first port of call lures you beyond the borders of Italy for a not-to-be-missed chance to explore Corsica. Set out on an excursion that introduces you to the city of Bastia, a place of Baroque churches and charming harborfront. Visit the Mattei distillery to sample the city’s signature aperitif, Cap Corse, a wine with a uniquely bittersweet profile. Drive to the nearby village of Cardo and join your local guide, who leads you to a favorite food truck on the village square for lunch and a true taste of Corsican life. Alternately, explore the mountainous heights of Bastia on a hike, taking in its fragrant maquis (shrub vegetation), and superb views of the city and shoreline. Stop to visit a pair of icehouses, one of which dates back to the 16th century and both of which were in use well into the 20th century. Enjoy an awe-inspiring Corsican choir performance performed just for A&K guests. Disembark this morning in the port of Civitavecchia, and then board a motorcoach for the drive into Rome, where you have your pick of expertly designed excursions. If you’re a food lover, opt for a three-hour, hands-on lesson in the art of Italian cuisine, learning the secrets to delectable pasta, ravioli and tiramisu. Alternately, discover Rome’s extensive Jewish heritage with a tour of the historic Jewish Ghetto, followed by the Vatican for an afternoon viewing its incomparable treasures. Also an option is a tour of central Rome’s narrow streets and spacious, sunny piazzas, including world-famous Trevi Fountain and a private visit to Palazzo Colonna, the grandest of Rome’s noble residences and a Baroque gem. Spend the morning cruising the Tyrrenian Sea, enjoying postcard-worthy views of the Aeolian Islands and the volcanic peak of Stromboli. Arrive at the island of Lipari, where you may disembark for sightseeing and an evening of lively local festivities. Begin your exploration of Sicily with a choice of three inspiring excursions. In the first, take in the sites of capital city Palermo, including the Teatro Massimo, Palermo’s Duomo; the Quattro Canti, a spectacular Baroque square; and the 12th-century Cataldo Church. Another option is a journey into Siciliy’s rich cuisine, starting with a shopping expedition to a local outdoor market for ingredients. Proceed to a private palace for a three-hour, hands-on cooking class, where you learn the importance of food to Sicilian culture and prepare a four-course lunch. For your third option, visit Segesta, one of the finest Greek temples in the world, and then drive up the hill to Erice, stopping for lunch at a local farmhouse. Erice boasts some of Sicily’s most tantalizing views over the Trapani coast, as well as its own distinctive almond pastries, which you sample before returning to the ship for dinner. Explore the eastern shore of Sicily with a day in and around Taormina, a clifftop city of narrow, store-packed streets and spectacular views. Walk the city with a local guide and visit the Greek Theater, a great vantage point for viewing Mount Etna. Alternately, explore Catania, the most prosperous city in Roman Sicily and today filled with well-preserved ancient buildings. If you prefer to get up close to Sicily’s greatest landmark, take a driving excursion to Mount Etna, viewing its stunning crater and learning about this volcanic peak’s history. However you spend your day, enjoy a spectacular evening gala at a stunning private castello (castle) with a captivating history. Sit down to a lavish banquet punctuated by a variety of local entertainment and surprises. Relish a day of relaxation, enjoying the amenities of your ship and more engaging presentations. Disembark in Puglia’s coastal Manfredonia for an enticing array of excursion options. You may visit the Sanctuary of San Michael Archangel, a pilgrimage site since the Middle Ages; hike in Gargano National Park, a place of white limestone cliffs, serene olive groves and beautiful sea views; or explore Castel del Monte, built by the innovative Holy Roman Emperor Frederick II and one of the most intriguing historic sites in Italy. Further up the coast lies the port of Ancona, your starting point for an inspiring afternoon. One excursion takes you to Urbino, a UNESCO World Heritage Site recognized for its Renaissance art and architecture. Enter the stately Palazzo Ducale, where masterworks by Raphael and Titian are on display. Alternately, visit the Villa Imperiale in Pesaro, proceeding then to the quaint port town of Senigallia, which boasts both a majestic old fort and a white-sand coast known as “Velvet Beach.” Food lovers may opt for a wine-themed trek to the nearby walled villages, known as Castelli di Jesi, where local vintners make their famous Verdicchio varietal. Enjoy a tasting accompanied by some fresh local snacks. A worthy finale of your cruise, Venice is an endlessly inspiring place, and today’s excursions reveal it the way you want to experience it. The first option is a comprehensive tour of the island, from must-sees like St. Mark’s Square to places more off the beaten track, such as Frari Church, where Renaissance painter Titian is interred. Lovers of wine can opt for a visit to Mazzorbo Island, known for its walled vineyards as well as its bacaris: charming wine bars where locals and visitors alike gather for un’ombra (a short glass) and cicchetti (small bites). For a more active option, learn to row like a Venetian when an experienced gondolier teaches you the secrets of navigating Venice’s canals in the traditional way. Bid farewell to your Expedition Team and fellow guests, and transfer to the airport for your departing flight or join our optional extension to Verona. Categories 4-8 include upgraded accommodations at the hotel and butler service on board the ship. First group event: welcome briefing and reception at 6:00 p.m. on Aug 18. Last group event: disembarkation on Aug 30 by 9:00 a.m.